As the Education Extension Officer at Woodland Cultural Centre, I receive many requests to do workshops and presentations. The request I receive most often is can you come and do drumming? I do own an Anishinaabe hand drum. I sing and play it because I love the sound of it. But if I were to play my own Haudenosaunee drum it would be a water drum, less impressive in size but still rich and beautiful in tone. I’m not a drummer so I do not offer this as a workshop. The second request I get most often is, can you come and teach pow wow dancing? I know the round dance. It has a noteworthy meaning with simple steps, not very exciting as pow wow dances go, so I know this is not what the teacher is looking for. Once I was asked, “Can you wear your Indian clothes for the students to look at?” I immediately look down at what I am wearing and I think how disappointed the children are going to be! I have discovered since working at Woodland Cultural Centre that some phone calls will afford me opportunities to be offended. But If I am in the position to educate, then my response to any of these requests is to welcome the opportunity to correct misconceptions. I can’t blame people who ask what I consider stereotypical requests. I realize that most people, that even though they may have lived their whole lives here in Canada, they have not been taught about First Nations people in a way that is accurate and respectful. Even my own elementary school memories contain the image of I is for Indian. Today, there are many diverse cultures represented in our classrooms. So more than ever before, we need to open our minds of understanding, celebrate that diversity, and give children the opportunity to be proud of their heritage. I have met some extraordinary educators who have made an effort to learn about Haudenosaunee traditions and culture, and have been willing to look at contemporary issues First Nations people are faced with. They have invited me to their educational institutes, or they have brought their students to the Woodland Cultural Centre Museum to go beyond the surface level of what has been required of them to teach in their classrooms. I applaud these teachers. The Woodland Cultural Centre is, and has always been, here to give support to anyone who is interested in knowing more. Each diverse culture has value and integrity that we can choose to accept and appreciate. I can only speak for mine because I have had the privilege of growing up on Six Nations, and I have spent all my life living within this culture. We are all human beings and we all have language, family values, oral traditions, history, world-views, government, education and a health practices. All of these things are based on our culture. They are the stories we have been told, and are the teachings of our elders that pass this knowledge down to each generation. So when I see the teaching of Aboriginal Studies, by making dreamcatchers and cardboard longhouses, I can’t help but feel students have not been giving enough information of whose culture these items represent and what their significance is. Some have rushed passed and some have stopped and taken the time to be accurate and respectful in teaching the culture of the Haudenosaunee; People of the Longhouse. Information of First Nations people can be studied not only in Social Studies, but in Science, Geography, Physical Education, Family Studies, Math and Art. I am continually finding ways to have workshops in every subject in every grade. When I was asked to teach moccasin making and beading, I took on the challenge of practicing what I preach. I do not know how to do either of these, but I said yes. I taught the geographical history of the moccasin, who wore them, why and the differences from Nation to Nation. I taught the beadwork styles, how different they are from each Nation and what the symbols mean, what kind of beads were used and how do moccasins look today. 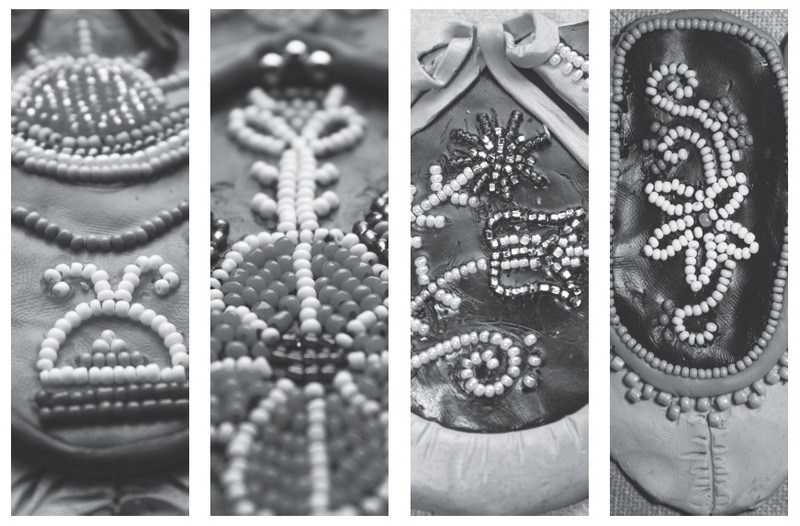 We designed a beading pattern, created a moccasin toe out of clay, and carefully created their sketches out of beads that were painstakingly placed into the clay using a toothpick. Now these students were ready to actually have someone come and teach them to make moccasins and to bead them. They now could appreciate the cultural importance of the moccasin and the individual meanings of the beadwork. Exposing students to the culture of First Nations people’s history and contemporary issues promotes understanding and this will build healthy relationships within a community. I believe the classroom is the perfect place to derail the image that I is for Indian. As a visual artist, when I teach, I like to use contemporary art in the classroom, so that students will know that the Haudenosaunee are contemporary people who live in the modern world but have continued their ancient world-views. I read a quote one time; I’m not sure where or by who but it has always stuck with me. “We have misunderstood each other for hundreds of years and healing of relationships will not come easily, quickly or without effort.” So every day I consciously make that effort to take down walls of misunderstanding and to build relationships based on respect.